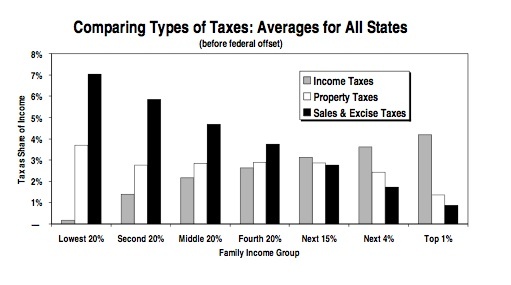 Tax Justice Network: New study: regressive state taxes in the U.S.
That's odd. I had a look at their data, and it shows the exact opposite of what they say! The ten "bogeyman" states show a larger fraction of state income to the bottom quintile families. In the "least regressive" states listed, the bottom quintile households enjoy a lower fraction of the income than elsewhere. The effect is illustrated nicely with "particularly regressive" Tennessee, where the bottom quintile enjoys 14.9% of average income after tax. In a "Progressive" example, Delaware, the bottom quintile only get 13.6%. In fact, if you find the state which seems to be trying to do everything wrong, New Hampshire (no broad-based personal income tax, high reliance on "regressive" property taxes), the poor families are stuck with 15.9% of average income. The lesson is that their so-called "regressive taxes" actually boost poor families spending power compared with states avoiding them. I did check a substantial amount of their data, and the trend is clear. Don't live in California, which is pulling out all the "progressive tax" stops - there the poor are really suffering. Go and live in "regressive" Maine if you want to avoid poverty. The theory is pretty simple, and has been covered endlessly in the comments on this blog by numerous people. Taxes indirectly transfer wealth to home owners, bankers, bureaucrats. Taxing ordinary production and consumption transfers wealth out of the hands of ordinary people. Property taxes are incident upon home/land owners and the banks - in effect paying for the transfers they get from the government. The real question now is since the data clearly shows the opposite of what ITEP says, why haven't they noticed and issued a retraction? Their study is now in its third edition, and you'd expect them to have fixed it by now! Just so there's no doubt about terms, I'm just using Nobel laureate William Vickrey's definition of "progressive"/"regressive" : "Progressive taxation may be defined as taxation which tends to promote economic equality" William Vickrey - Agenda for Progressive Taxation. You can't get more basic than that! Perhaps the TJN can help explain what's going on with the ITEP version of reality?